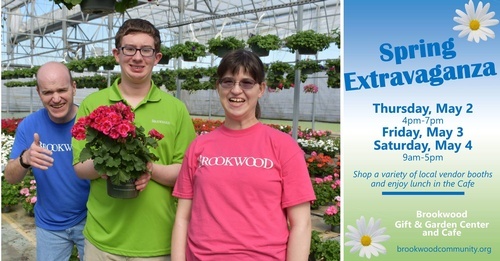 Join us for a weekend full of fun and shopping at the annual Spring Extravaganza benefiting Brookwood’s adults with disabilities. Come shop for a good cause and let your retail dollar do double duty, just in time for Mother’s Day, graduation and end of school celebrations. Shop a variety of exceptional local vendors featuring unique home décor and gifts, clothing, jewelry, food and much more. Visitors can also shop at Brookwood’s Gift and Garden Center filled with the Citizen’s handcrafted products and beautiful spring flowers that were planted and meticulously cared for by our Citizens. Shoppers can also enjoy a delicious lunch in Brookwood’s gourmet countryside Café. No Cafe reservations will be taken in advance. Upon arrival, sign up for seating times between 11am - 2pm. For more information, please visit our website at brookwoodcommunity.org or call 281.375.2149.